In the south of Crete, on the edge of the village Kamilari lies Villa Estia, a detached house with a beautiful view to the village, the Libyan Sea and the Ida mountains. The 4-room villa is spacious and luxury furnished. A comfortable livingroom with two sofas and a fireplace. A flatscreen-tv with satellite, a DVD-player and a Radio/CD-player. The modern kitchen is fully equipped with a dishwasher, a microwave, an oven, a stove with 4 plates and a large diningtable with 6 chairs. In the hall there is a separate toiletroom. Outside in the garden there are several sitting areas and lies a pool with sunbeds and umbrellas. From the livingroom as well as from the garden one has a beautiful view. On the first floor are three separate bedrooms. The first bedroom has a double bed and a balcony with marvelous view. The second bedroom has 2 single beds and a small balcony. The third bedroom has a bunk bed for two persons. All three bedrooms have airconditioning. The bathroom has a bath, separate shower and a toilet. A washing machine is available. 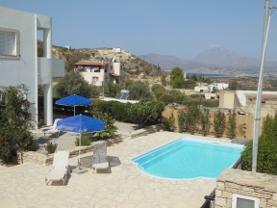 The villa has central heating, internet via WLAN and is suitable for the maximum of 6 persons.